Each time you donate blood you save up to three lives. At Global Care, we are strong advocates for becoming a blood donor. Our DNA is Mates Helping Mates and there is no better way to help a mate than to donate blood to save his or her life. 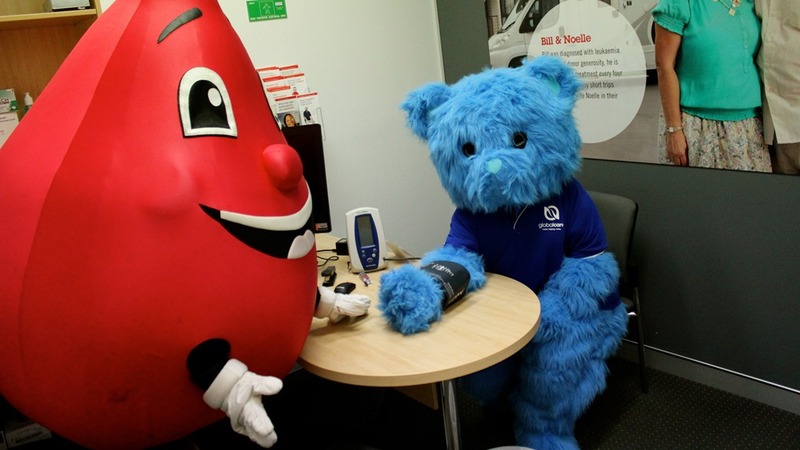 Bluey Bear, The Global Care Mascot, recently went to the Robina Blood Bank to meet the Blood Bank’s Mascot, Billy Blood Drop, and to give some blood. First up here are some blood donor facts. Australia currently needs 25,000 blood donors a week. 34% of blood donations help treat people with cancer. 19% of blood donations goes to help people with other causes of anemia. 18% of blood donations goes to surgical patients. 14% of blood donations people with Kidney issues. 4% of blood donations go to help new mothers, babies or young children. 2% of blood donation go to road trauma victims. Global Care has become a Partner Organisation with the Red Cross through their Red25 program. This is where people connected with Global Care can go online and register that they are part of Global Care and then every time that person gives blood, that donation will become part of Global Care’s Organisational Tally. Ultimately this allows us to see the number of lives that Global Care people have saved through donating blood. The link to register is https://www.donateblood.com.au/red25/join-group. But whether you are part of Global Care or not, the aim of this blog is to encourage eligible people who aren’t currently donating to begin donating. 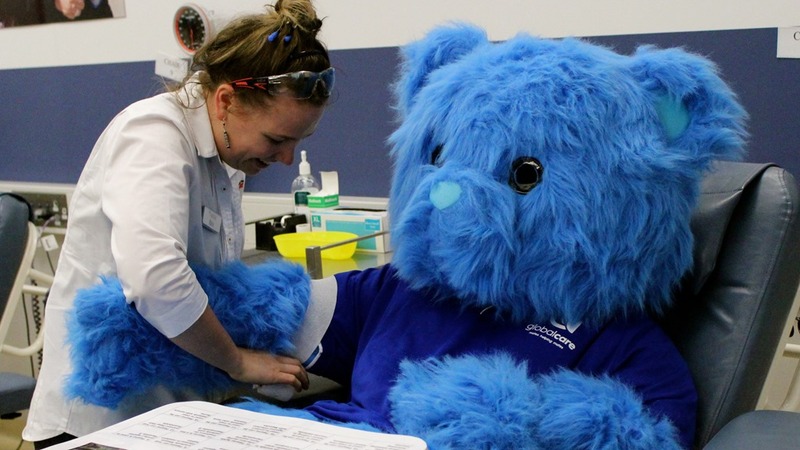 So here is the story of Bluey Bear’s trip to the Robina Blood Bank. 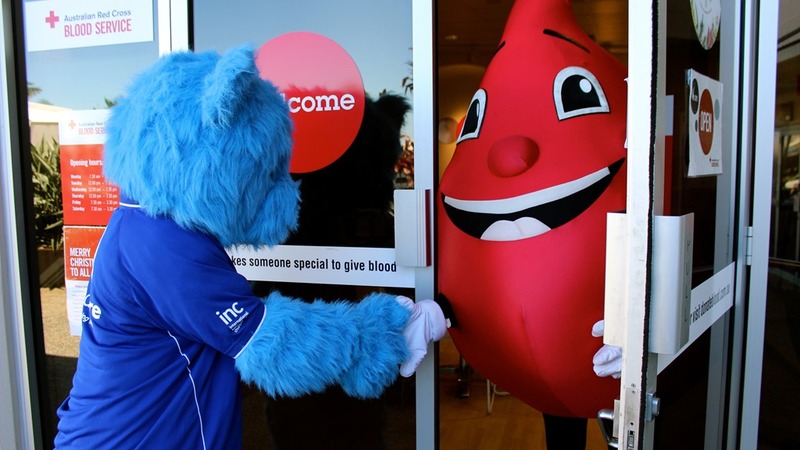 Bluey Bear was warmly welcomed by Billy Blood Drop. In fact, Billy and the entire staff at the Robina Blood Bank are always very friendly as are all the staff at blood banks across the nation. 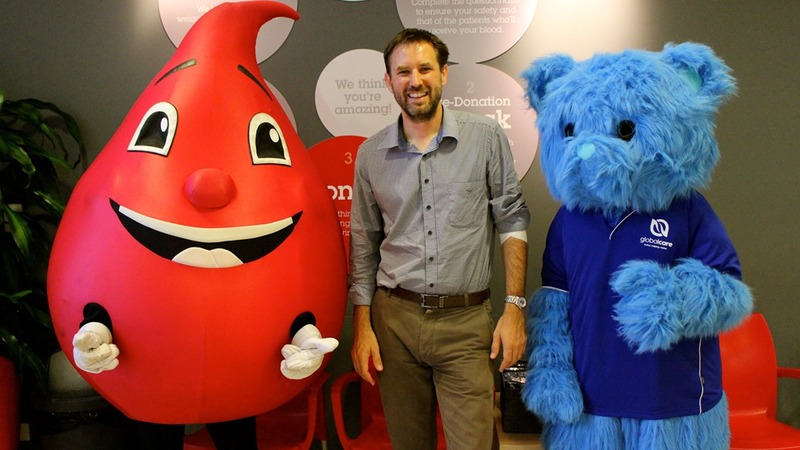 Once inside, Bluey Bear and Billy Blood Drop ran into local area Councillor Glen Tozer, who had just donated and was on his way out. So what happens when you have two Mascots and a politician…..a photo op. So here is the resulting pic. Once the Photo op was done, Bluey Bear and Billy Blood Drop had a quick hug and then decided to get down to business. 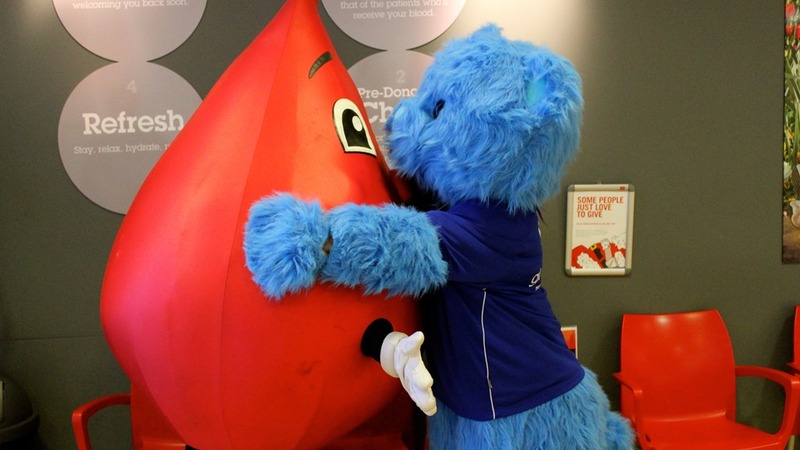 Billy Blood Drop unfortunately was born with really short arms and so Bluey Bear did all the hugging. 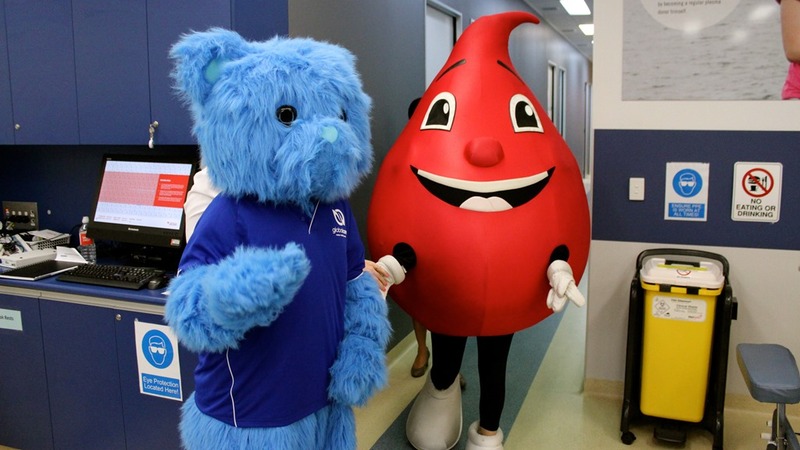 It seemed a little awkward but Billy Blood Drop was loving meeting Bluey Bear so it was all good. Bluey Bear first had to fill out the interview questionnaire. Thankfully there was no question on the questionnaire that asked Is your blood blue? 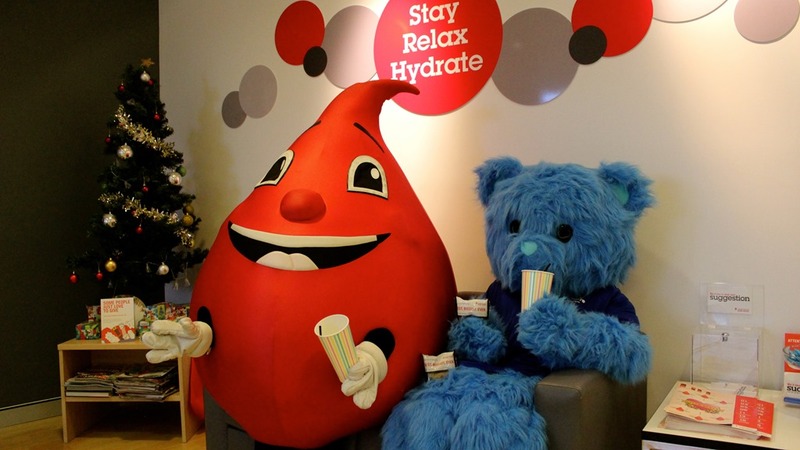 Bluey Bear was then asked if he needed to go to the bathroom as before giving blood, Bluey had to drink lots of water to be super hydrated. Apparently Diet Coke is not an appropriate substitute. So after that, Bluey was taken to the donor room. 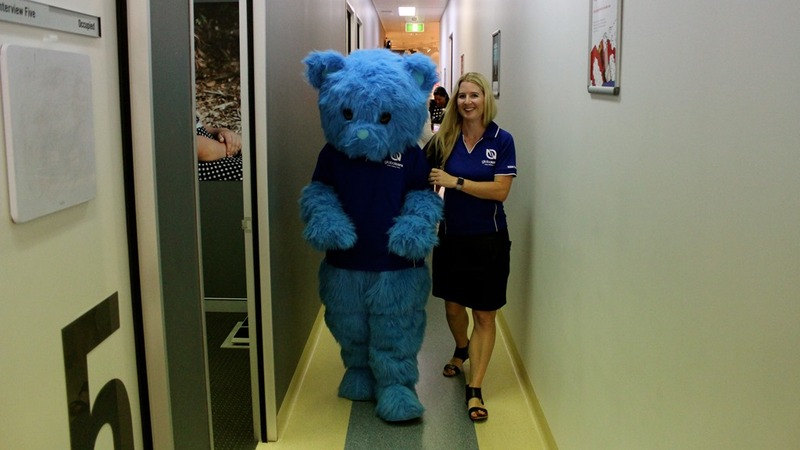 As it was his first time, Bluey Bear was feeling a little apprehensive so Charlotte from Team Global Care, gave him some reassurance. 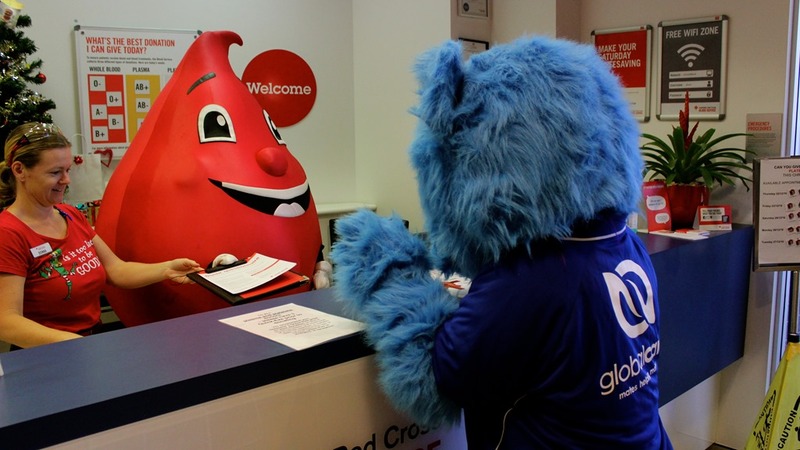 Billy Blood Drop explained to Bluey Bear what was going to happen and then offered him a bottle of water or an Apple Juice. Bluey did ask for a Diet Coke but the Blood Bank doesn’t serve Diet Coke. He took the Apple Juice. 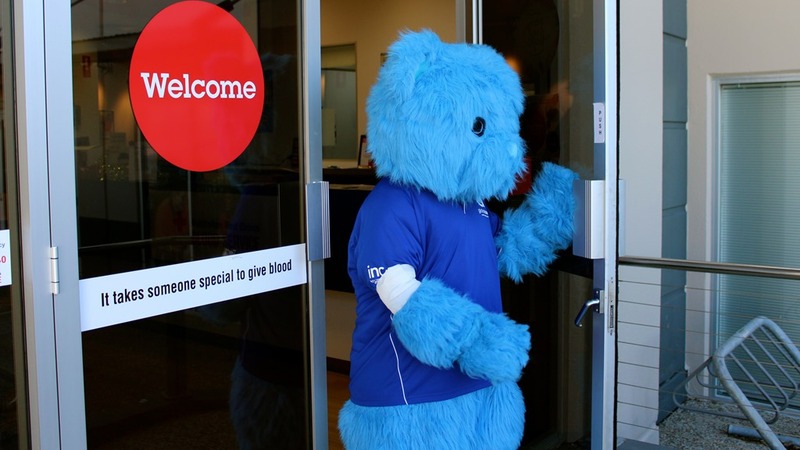 Bluey Bear was then connected up to a machine and donated his valuable blood. It only took about 10 minutes to give a pint. 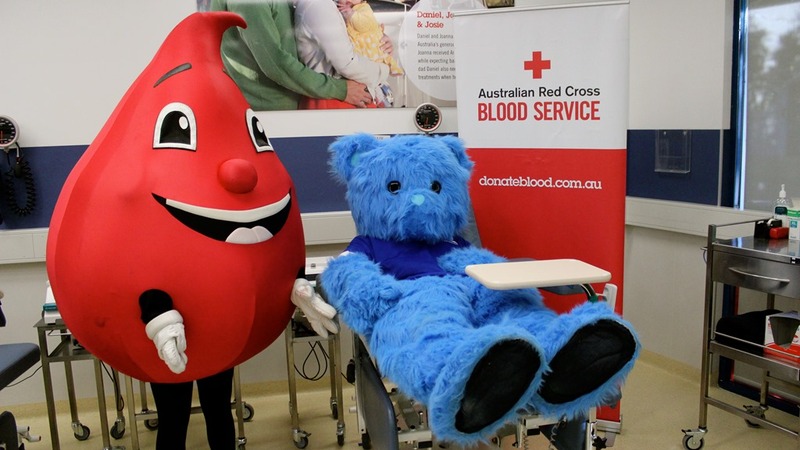 Bluey Bear was very very happy that he saved three lives but unfortunately Bluey Bear was born without the ability to smile. But the smile he had internally was huge. About as large as Billy’s external smile. Bluey Bear’s arm was then bandaged. 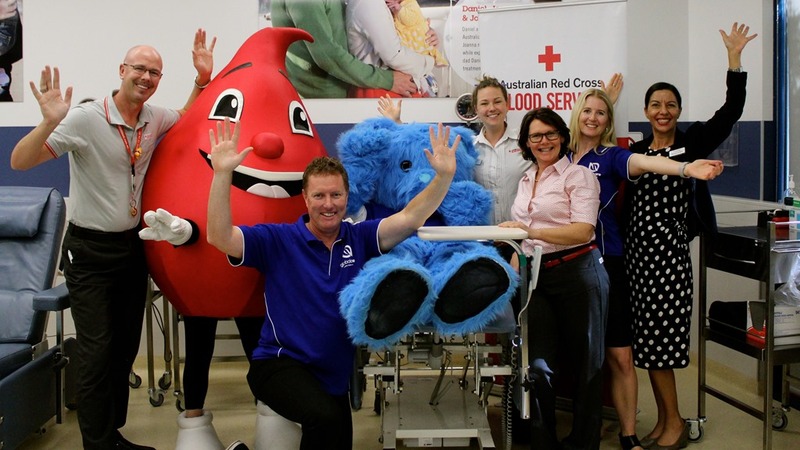 Bluey thought a nurse had to do it as Billy Blood Drop’s arms were too short. But he wasn’t sure. After it was all done, it was time for another photo op with the great staff at the Robina Blood Bank and some of the Global Care Team. I know in this photo you can’t really tell if Billy Blood Drop has his arms raised, but I think we have visited that before. Bluey Bear and Billy Blood Drop then retired back to the reception waiting area to enjoy a well earned free milkshake and a cookie. Unfortunately, Billy Blood Drop needed a super long straw. They chilled and chatted about the people who desperately rely on people to donate blood regularly. They then thought it would be awesome to sing some Christmas Carols but seeing neither speak it was a pretty quiet rendition. 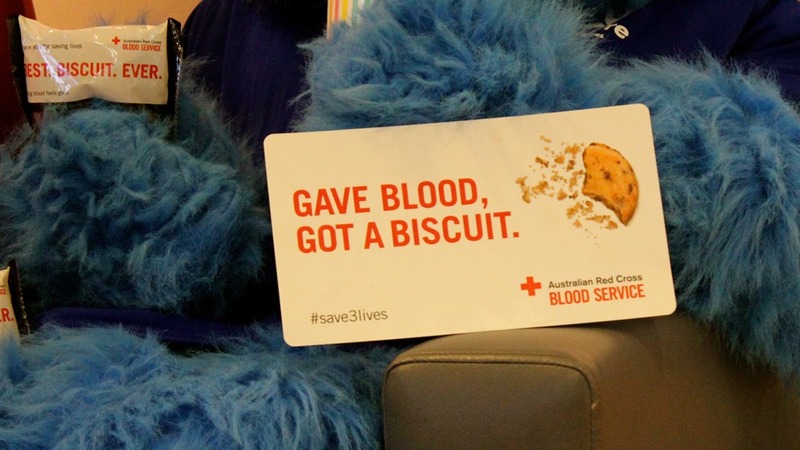 Bluey Bear was reminded to post all his pics to Social Media using the #save3lives to encourage others to be heroes. Bluey Bear then made another appointment for 3 months time and left feeling amazing that he had been a mate who helped a mate or three. He was reminded to keep his bandage on for a further two hours. Donating Blood is a cause close to my heart. Not because someone close to me has a blood disorder or died of cancer. It’s close to my heart because there is a great need in our nation for 25,000 blood donors a week and if I can be part of the solution to that challenge then that is me being others focused with a very precious commodity to me – my blood. I actually am not allowed to give blood because I visit PNG regularly, but I can give Plasma which for me is even better as I can give it every 2 weeks. I have managed I think about 18 donations this year and I am aiming for 26 next year. I was so proud of my daughter Lakeisha who recently donated for the first time at 18. My other daughter Laura (who was Bluey today) is busting to become a donor but at 13, she has 3 more years to wait. So here is the bottom line. Wouldn’t it be awesome if the Blood Bank was constantly supplied with blood from Christians who understand that they are saved themselves through the ultimate Blood Donation: that of Christ. Sure we as Christians love to take communion and remember the Blood of Jesus…..then let’s take this memorial message of communion and go and save the world with: literally our own blood. Previous Global Care Provides Counsellors Post Adelaide Fires.